Education and public outreach (EPO) is an essential part of any research organization to get the community interested in science and to spread knowledge about the interesting research members of the Institute of Meteoritics (IOM) are currently conducting. 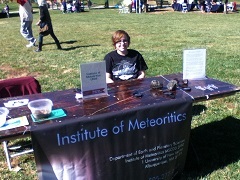 Our graduate students and undergraduate volunteers travel all around Albuquerque to discuss meteorites and solar system processes with children and adults. Recent events include hosting an exhibitor’s booth at the NM Museum of Natural History and Science’s Teacher Open House where lesson plans were provided for teachers to incorporate space exploration into their classroom. 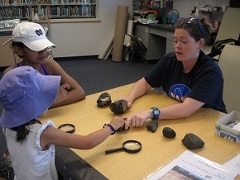 Other events include personalized classroom visits to the Montessori Middle School and ABQ high school to teach students the difference between meteorites and terrestrial rocks. There are two common activities brought to each event: one involves a discussion of what meteorites are, where they come from, and how we identify them, and the other involves a simulation of where on Earth it is easiest to find meteorites. More recently, the IOM’s EPO program united with the ABQ Astronomical Society and ABQ public libraries to start a summer reading program. This involved numerous visits to libraries all over the city where children were able to learn about space, hold meteorite samples, and get suggestions about related summer reading material. All EPO efforts are funded by the NASA Dawn and MSL missions as well as the IOM through Dr. Horton Newsom and Dr. Carl Agee, respectively. The IOM EPO program is made possible through the support of the NASA Dawn mission and the NASA MSL mission. Dr. Horton Newsom is the UNM consultant for the Dawn EPO team as well as a ChemCam Co-I on the MSL mission.